The other day I was chatting with a neighbor and I discovered that we have a few things in common. We’re both enthusiastic home cooks, we both have lots of kids, and we share the conviction that parents who claim that their kids eat everything are lying. Right? Right? To be fair, I understand that many children—and some adults—live in fear of Brussels sprouts. J claims that he choked them down as a child only by burying them in a pile of Parmesan cheese so deep that they were completely obscured. Others claim to be genetically disinclined. Fear no more. Find firm, bright-green Brussels sprouts for this dish and you’ll find them sweet and tender-crisp. They’re shredded so finely that they tangle into your dish of pasta quite agreeably. This meal has been a family favorite for a long time, so I can vouch for many variations. Tonight we used whole wheat pasta and anointed the finished dish with a drizzle of olive oil and finely ground black pepper. For a richer dish, you can cook the sprouts in butter, use fresh egg pasta, and finish the dish with a flurry of freshly-grated Parmesan cheese. You can even toss your pasta with roasted Brussels sprouts and toasted pine nuts—if you can keep yourself from eating the roasted Brussels sprouts straight from the pan. But if your kids gobble this down, I want to hear about it. We served bowls of cheesy whole-wheat spaghetti to our girls tonight, and kept the good stuff to ourselves. That’s real life when it comes to feeding kids, at least around here. 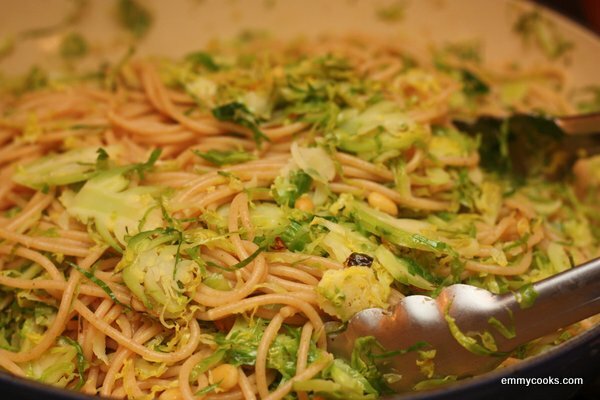 Pasta with Shredded Brussels Sprouts and Pine Nuts (adapted from Gourmet): Boil half a pound of pasta in salted water. I like fresh or dried linguine or whole-wheat spaghetti. While the water is coming to a boil, trim and finely shred a pound of Brussels sprouts (I use the 2mm blade on my food processor). While the pasta is cooking, heat 2-4 Tbsp. olive oil (or a combination of olive oil and butter) in a wide pan over medium heat. Add 1/4 c. pine nuts and stir constantly for a minute or two, until golden. Add shredded Brussels sprouts to the pan with 1/2 tsp. salt and a good dose of freshly ground black pepper and saute until crisp-tender and browned in spots (3-5 minutes). Remove from heat. Reserve a cup of the pasta water and add the drained pasta to the Brussels Sprouts. Use a tongs to mix well, adding some of the reserved cooking water and/or a splash of olive oil to make the pasta glisten. Add additional salt to taste if necessary. Serve garnished with any of the following: Parmesan cheese, olive oil, or additional black pepper. p.s. Of course you can always cook Brussels sprouts this way, with or without the pine nuts, and serve a feathery pile of them alone as a side dish. 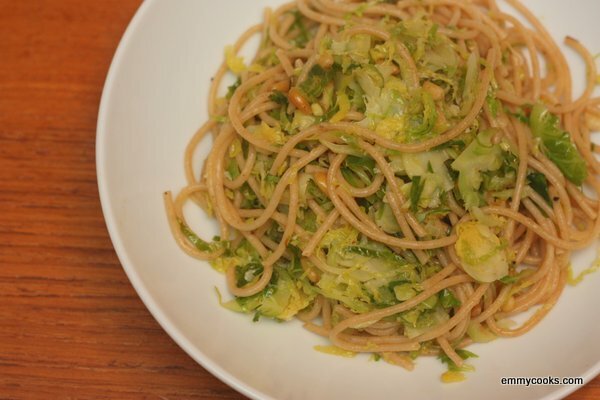 This entry was posted in Feeding Kids, Food, Noodles, Recipes, Vegan or Would-Be-Just-As-Good-Vegan and tagged brussels sprouts, pasta, picky kids, whole wheat pasta on November 26, 2012 by emmycooks. I like the sound of the brussels and pine nuts with pasta – maybe with the addition of some chilli. I’ve never thought to shred the brussels sprouts. They’re my husband’s favourite vegetable. I’m definitely trying this! Well, I certainly didn’t eat everything as a child, but I loved Brussels sprouts. And so did my majestically picky sister. I guess there’s no accounting for taste! This looks delicious, though–and a perfect use-up for leftover roasted Brussels sprouts from Thanksgiving! Oooh! I love this. Looks so yummy. I have to admit that I ate everything as a child. My parents are notoriously picky eaters and they drove me crazy leaving out certain things because they didn’t like them. Things like ginger, green onions, onions, any kind of pickle. Drove. Me. Nuts. My father hates vegetables, which is probably the primary reason I became a vegetarian for a while! Emmy this looks fantastic! I love Brussel sprouts and this is such a clever and tasty way to use them. Yum! I find it incredibly odd that my kid loves pesto made with spicy arugula and lots of garlic, but he won’t even go near a leaf of plain spinach. Kid tastes are weird. But this looks so lovely, I might make it just for the adults in our house. Poor brussell sprouts…they have such a terrible yet poorly deserved reputation. My four year old would (will) love this. My one year old would not. The four year old really almost eats anything – except broccoli. AKA, the one veg that is a reliable hit with the baby :) Kids are funny, but noodles are almost always a good vehicle to bring veggies to my little ones! I recently tried roasted Brussels sprouts for the first time and although I’m not exactly afraid of them, I just didn’t enjoy them. Perhaps I have that gene? I love how often you make me consider a food a whole new way. My kids are adults now, and they still won’t eat everything. Example – Me to son: Want to come over for dinner? Son: What are you making? – Ha! I’ve made one souffle in my life, and when I set it in front of my then 2 year old, she took one look and screamed. So, I too am suspect of those people who say their kids eat anything, although I believe it does happen somewhere in a parallel universe. I have a cabbage, potato and pasta dish that all my kids love (go figure), but I figure they’d balk at the idea of brussels sprouts and cabbage. Never mind, it sounds pretty good to me! Even the kids like brussels sprouts at my house, but I always dress them up a bit, roasting and adding flavors, lemon, honey, orange zest, etc. The shredded sprouts in this recipe look great. I’ll try this next time I get brussels sprouts in my CSA box. Soon, I hope.